Every Wednesday Mel & Jeziel catch up on the last week and share something they’ve learnt in the last 7 days for show and tell. Whether, it be a mind blowing moment or a small ah-uhhh moment, they bring it to the family to share they’ve learnt. This week Jeziel discovered something a little heavy. In a vault, deep beneath a castle in Paris, sits an apple sized, metal cylindar. This perfectly balanced chunk of platinum-iridium alloy determines the weight of the world. But, the kilogram will soon be out of a job. Scientists all over the world have decided that there must be a more accurate way to measure weight. Each time Le Grand K has been taken out to use, it is cleaned and by the time it goes back into it’s vault, it has lost 50 milograms (the weight of 1 grain of sand). This is too inaccurate. 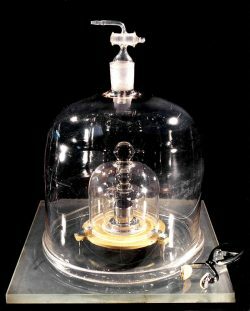 The kilogram will be replaced with a universal formula that defines the kilogram using the quantum laws of nature.